Former FBI Director James Comey told ABC News in his interview aired Sunday night that his entire family were passionate supporters of Hillary Clinton for President and his wife said she cried the night Trump won. 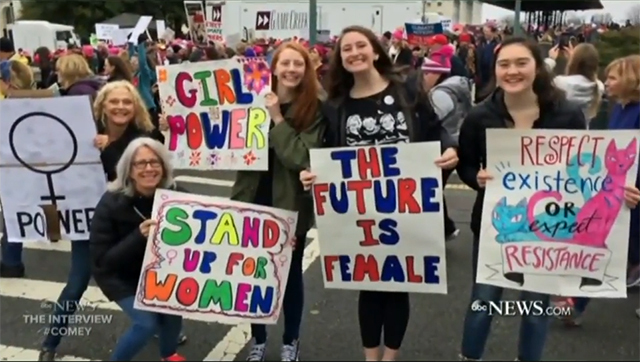 "My wife and girls marched in the Women"s March the day after President Trump’s inauguration," James Comey told ABC's George Stephanopoulos. "At least my four daughters, probably all five of my kids, wanted Hillary Clinton to be the first woman president," he said. "I know my amazing spouse did." "I wanted a woman president really badly, and I supported Hillary Clinton," Comey's wife Patrice Comey told Stephanopoulos. "A lot of my friends worked for her. And I was devastated when she lost." "I just can't even imagine the pain she's gone through. I cried Election Day. I went on the Women's March the day after the inauguration. And I'm hoping for a woman in 2020," Patrice Comey said. Comey claimed throughout the interview he was totally impartial, but then said he thinks Trump's a serial "liar," "morally unfit to be president," a "stain" on everyone who works around him and treats women like "meat." The most striking aspect of the interview was the way Comey doesn't seem to have any comprehension of the fact he's living in a bubble in Washington DC where Trump only got 4 percent of the vote and Hillary got 91 percent.